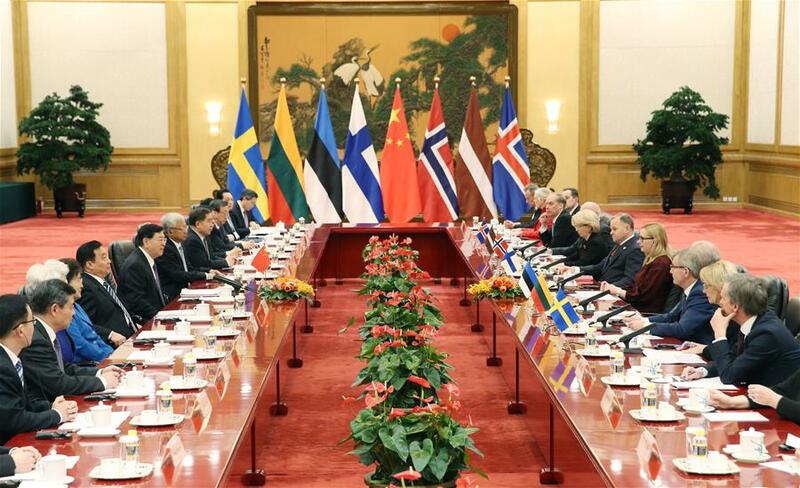 BEIJING, Jan. 8 (Xinhua) -- Chinese top legislator Zhang Dejiang Monday held talks with speakers from Nordic and Baltic countries in Beijing, and they agreed to boost parliamentary exchanges and share experience in governance and legislation. The main delegates include Finland's Speaker of Parliament Maria Lohela, Norway's Speaker of Parliament Olemic Thommessen, Iceland's Speaker of Parliament Steingrimur J. Sigfusson, Estonia's Speaker of Parliament Eiki Nestor, Latvia's Speaker of Parliament Inara Murniece, Lithuania's Speaker of Parliament Viktoras Pranckietis and Sweden's Deputy Speaker of Parliament Eva Thalen Finne. Zhang, chairman of the Standing Committee of China's National People's Congress, said China and these countries had traditional friendship and good momentum of cooperation, especially in cooperation within the framework of the Belt and Road construction. "China is willing to work with Nordic and Baltic countries to promote ties in the spirit of mutual respect and learning, treating each other equally," Zhang said. He said their joint visit to China was an innovation and also showed their strong willingness to cooperate more with China. Zhang called on both sides to respect each others' core interests and major concerns, as well as their choice of development path. Zhang called for more pragmatic cooperation to benefit the peoples, and he also expressed his hope that governments would integrate their strategies. Zhang called for more people-to-people exchanges and cooperation in education, tourism, youth and sports. Zhang also briefed the guests on the 19th National Congress of the Communist Party of China. Speaking highly of China's development achievements and important international responsibilities, the guests said Nordic and Baltic countries would work with China to cement parliamentary exchanges, deal with the challenges of climate change and environment protection, and coordinate more on multilateral occasions. Chinese State Councilor Yang Jiechi also met with the delegation.